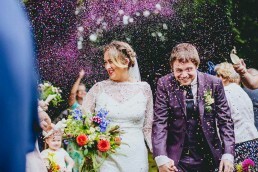 One of my favourite things about confetti as a photographer is how it always results in fantastic expressions on the couples face. Be it joy, excitement or even terror. One rule to remember if you want epic confetti photos is the more the better, no matter what kind of confetti you use. And that’s the thing, there are so many different types of confetti you can choose from. From petals, rice confetti and dried leaves to paper airplanes, popcorn and even human confetti (you’ll have to wait till the end to enjoy that one). There really is so much you choose from and even make up new ones. If it can be thrown and not cause injury, it can be used as confetti. Where Does Wedding Confetti Come From? 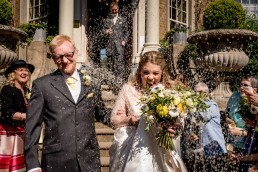 The confetti run is a great wedding tradition that injects an extra shot of energy into your day where by your loving guests get to launch objects at your face. Come to thing of it, wedding confetti is a bit of a strange custom. So where did it all start? It turns out confetti can be traced back to the middle ages in Northern Italy. Confetti is an Italian word for sweets. It was also used to describe the small plaster imitations of confetti that were thrown at carnivals as a form of celebration. These days quite a few venues don’t allow you to use non-biodigratible confetti, which rules out the traditional coloured paper kind. 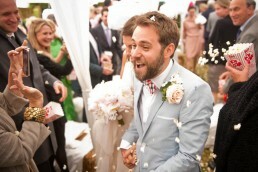 But fear not because the majority of the below confetti ideas are biodegradable. 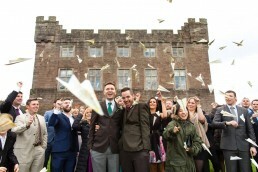 So in case you’ve been told this by your wedding venue or if you’d like to try something a little different, I’ve created my top list of alternative wedding confetti ideas for 2019. Enjoy! 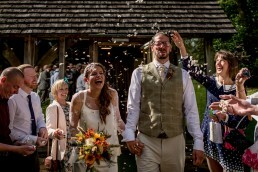 Btw in order to offer you the very best confetti ideas I’ve teamed up with some fellow wedding photographer buddies. 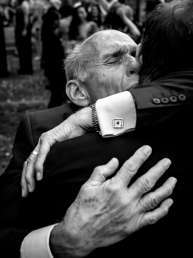 Each photo has been credited to the awesome photographer who took it. For venues that only allow biodegradable confetti rice is a popular option. In large amounts it can make for pretty awesome photos, but be warned, it gets absolutely everywhere. Just as Gemma and Chris discovered during their hot April wedding. Pompoms, in this case hand made by friends and family, are a fun option for the creatives out there. Yep, as well as a tasty snack popcorn can be used as confetti. 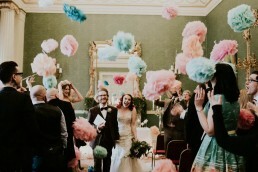 For this couple it was the ideal confetti solution to pair with their Circus Themed Weddings. Perfect for venues that only biodegradable confetti, using daises adds that extra dose of summer. In this case it was friends of the couple who individuals pressed every single daisy. Now that’s having an awesome team! I feel Paper Airplanes as confetti kind of sell themselves. They’re great fun for your guests but maybe suggest they blunt those tips to avoid unnecessary injury. Or in this case just launch them at the photographer. 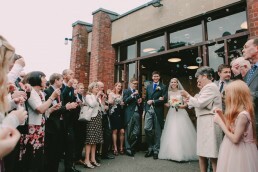 A popular solution when venues have strict rules on confetti use, bubbles can be great fun. 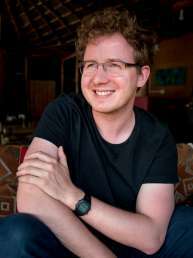 Just note that you will need a large amount for them to be visible in the photos. 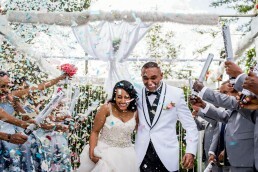 If your venue allows them confetti cannons are an awesome way to kick off your married life with a bang. From personal experience avoid setting them off close to peoples ears (I had ringing in my ears for 2 days after a premature explosion. First time I’d heard of this, but wow how cool is it having a fresh snow as confetti. 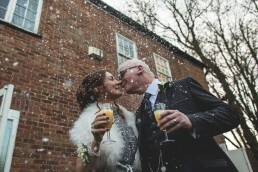 In this case the couple were lucky enough to own a snow machine and with a love for snow it made complete sense for their winter wedding. Glitter confetti adds a fun dose of colour that can be used to easily match your day’s theme. It is especially effective in photos when the sun’s out as it beautifully reflects the light. In this case the guests actually surprised the couple with the glitter confetti. A similar option to the rice, Lavender confetti can be a lot of fun but does get everywhere. I remember Tatum and James still pulling bits of lavender out of places at the end of the night. On the plus side, they did smell lovely. 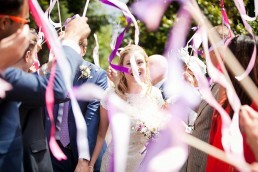 A form of confetti that won’t leave a mess, flying ribbons can be a nice and tidy option. It also goes very well with a festival wedding theme, like these two were enjoying. I hope you’ve enjoyed my list of 13 alternative wedding confetti ideas for 2019! There are so many different types of confetti out there beyond the traditional that you’ll hopefully find the perfect fit for you and your wedding. Be it one of the above, or a type of confetti that no one has ever tried before. 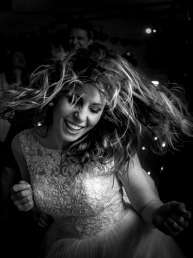 Thanks again to all the awesome wedding photographers who kindly provided their images for this post! 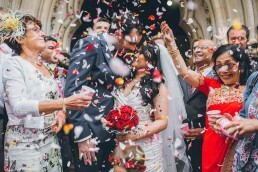 Have you seen other types of alternative wedding confetti? If you have photos of alternative confetti that wasn’t included in this article, let me know in the comments below and I can include it in an updated version in the future. If you’ve witnessed an alternative type of wedding confetti that I’ve missed then please let me know in the comments below. And please feel free to share this post with anyone else you think would benefit from it.